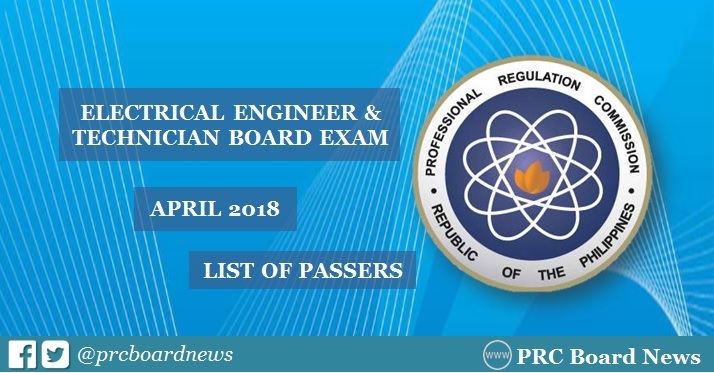 MANILA, Philippines - The Professional Regulation Commission (PRC) and the Board of Electrical Engineering released results of April 2018 Registered Electrical Engineer (REE) and Registered Master Electricians (RME) board exam today, April 24 or in three (3) working days after the last day of exam. The complete list of passers, top 10 (topnotchers), top performing schools and performance of schools are available on this page as announced online. UPDATE: 1,315 out of 2,523 Registered Electrical Engineers and 1,831 out of 3,656 Registered Master Electricians successfully passed the Electrical Engineer Licensure Examinations. PRC administered the first board exam for electrical engineers this year on April 17 and 18 (REE) and April 19 (RME) in the cities of Manila, Baguio, Cagayan de Oro, Cebu, Davao, Iloilo, Legaspi, Lucena and Tacloban. The members of the Board of Electrical Engineering who gave the exams are Engr. Francis V. Mapile, Chairman and Engr. Jaime V. Mendoza, Member. The two-day exam for REE covered the following subjects: mathematics, engineering sciences and allied subjects (April 17) and electrical engineering professional subjects (April 18). For RME exams, it covered technical subjects ( i.e. basic electricity, test equipment and electrical measurements) and Philippine Electrical Code (April 19). The passing general weighted average rating is seventy percent (70%) with no grade below fifty percent (50%) in any subject. Per PRC Resolution No. 2017-1068, the target release date of April 2018 Electrical Engineer board exam results is on Tuesday, April 24 or in 3 working days after the test. In April 2017 exams, results were released in three (3) working days. A total of 994 out of 2,213 Registered Electrical Engineers and 1,817 out of 3,130 Registered Master Electricians successfully passed the Electrical Engineer Licensure Examinations. The results of April 2016 electrical engineer board exams were also out in 3 working days. PRC named 808 out of 1,957 passers of REE and 1,633 out of 2,914 for RME. PRC Board News will update this page immediately once the electrical engineer board exam results are out online. You may also monitor release of results on PRC's official website (prc.gov.ph). Good luck all takers! April 2018 Electrical Engineer board exam Results are out on April 24th! Papasa tayo mates! Please PRC, pakilabas na po today list of passers for April 2018 electrical engineer board exam. Results please. Mataas daw passing?